The Dragonslayer is the 4th collected graphic novel edition of the epic and hilarious Bone Comic series by Jeff Smith. Stated by Time Magazine “as sweeping as the Lord of the Rings cycles, but much funnier,” the series has attracted a vast number of readers around the world and gained wide critical acclaims. In Bone Book4: The Dragonslayer, a huge wave of evil force is growing and about to strike. However, with all his mischiefs and cunning scheme, Phoney Bone himself could potentially be the worst enemy. 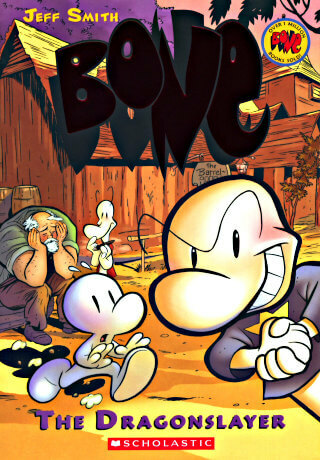 Continuing his hazardous adventure with Thorn, Fone Bone faces numerous dangers. Along with Granma Ben and Thorn, they come across the leader of the Rat Creatures Army himself, Kingdok. Meanwhile, behind the scenes, The Hooded One is gathering an army big enough to launch a full-scale war. Things are getting worse in Barrelhaven when Phoney Bone, in order to save himself and take advantage of the situation, has conned the townspeople. Phoney leads the people into believing that he actually is a strong dragonslayer. When he, surprisingly even to himself, does catch the Red Dragon and must keep his promise to slay the dragon, a dire situation takes place, shocks everyone, and makes the townspeople realize what they are really facing. The forces of evil are growing stronger — but could our heroes’ worst enemy be Phoney Bone himself?Fone Bone confronts a host of dangers in Book 4 of the BONE saga, The Dragonslayer. He and Gran’ma Ben and Thorn have a terrifying encounter with Kingdok, ruler of the rat creatures. The Hooded One is inciting his army to full-scale war. Someone is continuing to haunt Thorn in her dreams. And then wise Gran’ma Ben disappears.To make matters worse, Phoney Bone has hoodwinked the townspeople into believing that he is a mighty dragonslayer. When he actually does catch the Red Dragon — much to his surprise — he must face up to his promise: to slay the dragon at sunrise.